Just under a third (31%) of first-time buyers who managed to get on the property ladder in the last year, did so by making significant compromises on the quality of their lifestyle to save for a deposit[i]. The most common sacrifice was going on holiday (92%), foregoing nights out (30%) and some (13%) making a bigger lifestyle change by moving back in with their parents to save money. Keen home hunters looking for an affordable home without compromising on their quality of life, should consider Notting Hill Genesis’ latest Shared Ownership development, The Staging Post. 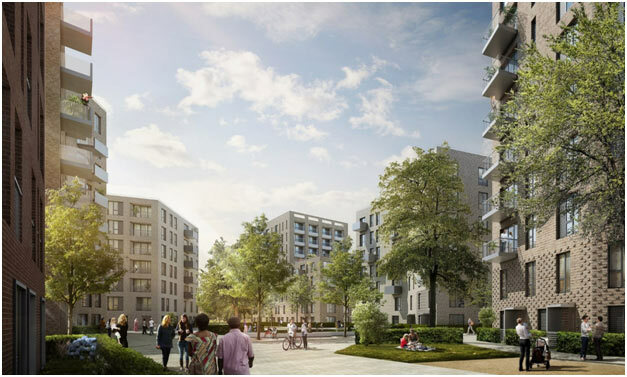 Occupying a prime position in the west London district of Hounslow, buyers can enjoy being close to the borough’s largest town centre, with an abundance of entertainment choices, award-winning green spaces and some of the best transport links of any London borough on their doorstep. Shared Ownership offers purchasers at The Staging Post the opportunity to buy a share of a home, between 25% and 75% of its full market value, while paying a subsidised rent on the remaining share. With deposits starting at 5% of the share value purchased, buyers can get on the property ladder from as little as £4,062 at The Staging Post. Less than ten miles from the centre of the capital, and overlooking the green expanse of Lampton Park, The Staging Post is a short distance away from the buzz of Hounslow town centre. Adding to what is already a thriving area, from 2020 buyers will benefit from an £18.5million investment program that will transform the current high street into ‘Hounslow High Street Quarter’. Aiming to provide a central hub for the local community, the major regeneration scheme will deliver a new multiplex featuring a 10-screen Cineworld, many new retail openings, a variety of restaurants and a new town square. Comprising a modern collection of one, two and three-bedroom homes, The Staging Post is ideal for buyers eager to take the first steps onto the property ladder. All of the homes have been thoughtfully designed to offer purchasers a variety of layouts, combined with the perfect balance of comfort and contemporary style. Open-plan living and dining areas provide a handy dual-use space. Fully fitted kitchens come with a range of integrated Zanussi appliances and bathrooms are modern in design with sleek sanitaryware. Residents also have access to on-site bicycle storage and electric car charging points. Residents at The Staging Post are just a short walk from home is The Treaty Shopping Centre, a large indoor complex with many popular high street names. For a more extensive shopping trip, the independent boutiques, cafés and bars found on Chiswick High Road are around a 15-minute drive away. For those seeking more of a lively atmosphere, the trendy riverside gastropubs, restaurants and upmarket retail quarter of Richmond are only a short drive away. For those who like to see local sights, the renaissance architecture of Syon House located within Syon Park which is both eye catching and perfect for a stroll along the River Thames, or the popular historic building of Boston Manor House is situated four miles away. The multi-award winning Bedfont Lakes Country Park is six miles from The Staging Post, with a nature reserve and playground. A short drive away is Hanworth Air Park Leisure Centre and Library, with a leisure pool, fitness centre and multi-use games area, and host to a number of high-profile music events and sporting fixtures, Twickenham Stadium, home of the England rugby team is also nearby. Commuters are well catered for, Hounslow Central underground station is less than half a mile away, served by the Piccadilly line and providing journey times of 38 minutes to Piccadilly Circus, 45 minutes to Kings Cross and St Pancras and 11 minutes to Heathrow Airport. For other routes, Hounslow East and Hounslow West stations are both less than two miles away. The development is also well served by several bus routes, making it easy to get around the town. The M25 can be reached in around 20 minutes via the A30.